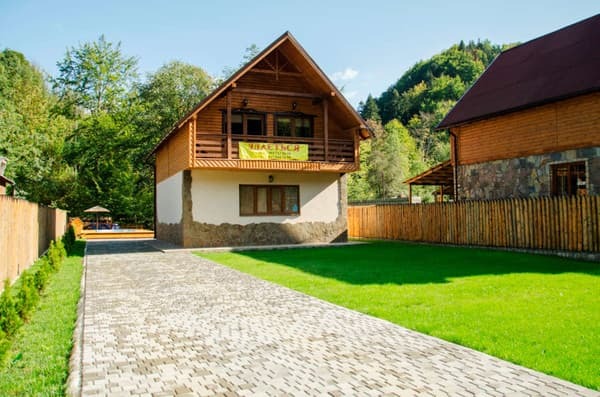 Cottage "Forest Fairy Tale" is located in the village of Migovo among the Carpathian Mountains. The house consists of two floors, where up to 6 people can be accommodated. In the cottage "Lesnaya Skazka" autonomous heating and round-the-clock supply of cold and hot water. On the ground floor there is a kitchen with a soft corner, equipped with everything necessary for cooking and a bathroom with a shower. 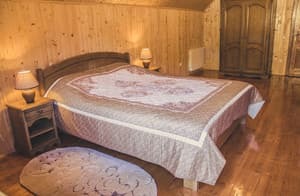 On the second floor there are two bedrooms with double beds and a bathroom. For tourists traveling by car there is parking. 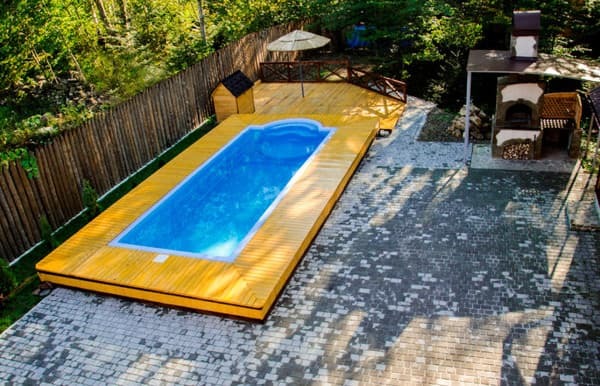 On the territory of the cottage "Lesnaya Skazka" there are gazebos, barbecues, heated pool. The distance to the nearest ski lift is 500 meters. 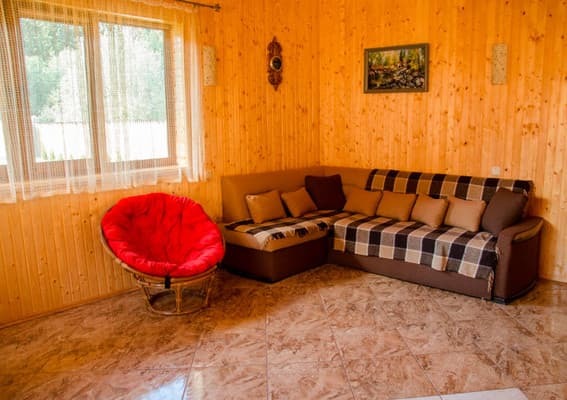 Description of the room: Two-storey cottage with everything necessary for comfortable living. It can accommodate up to 8 people. It has two bedrooms with double beds and an extra bed. On the first and second floor there are bathrooms with round-the-clock cold and hot water supply. 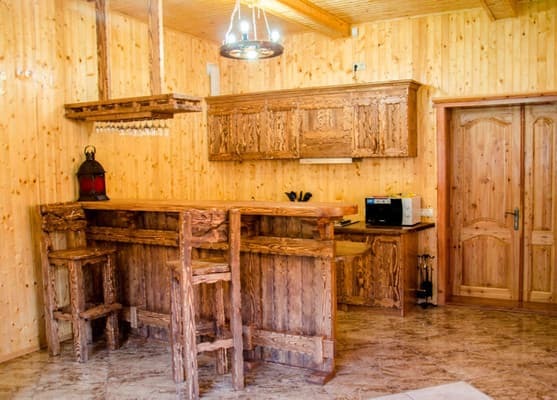 At guests' disposal in the cottage there is a kitchen for self-cooking. Отличная территория, ухоженная комфортно. На улице можно отдыхать и в дождь и в солнце. Детки заняты, безопасно. Взрослые отдыхают возле камина или бассейна. Вокруг прекрасная природа, целебные источники, чудная горная речка. Ловили рыбку, подымать на гору, гуляли по полянка. Ездили на Черемош. Вообщем - отличный отдых. The possibility of an additional place to specify when booking. 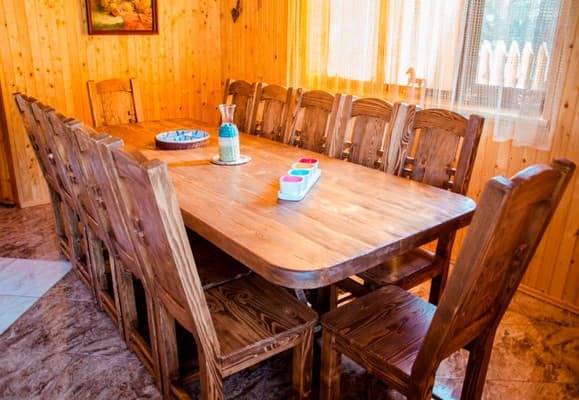 At guests' disposal in the cottage there is a complete kitchen with all necessary and dining area. Cottage "Forest Fairy Tale" is located 7 km. from the route Chernivtsi-Vyzhnytsya-Verkhovyna. The distance to the mountain ski resort "Migovo" is 500 m.
By train or bus to the city of Chernivtsi, farther from the AS-1 minibus to the town. Migovo (daily route on schedule). By personal transport, by the road Chernovtsy-Vyzhnytsya-Verkhovyna (R-62), in the village of Beregomet, turn after the sign of the "tourist complex Migovo".